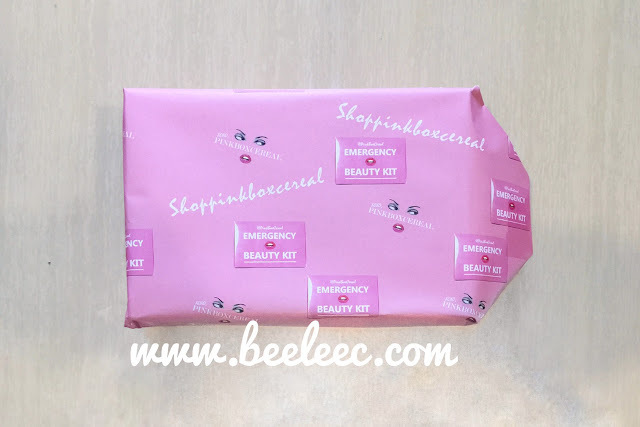 Here I am sharing with you my experience based on 2 weeks usage of this babies from the first #EmergencyBeautyKit in Malaysia, at Shoppinkboxcereal! Look at its wrapper, omg! Upon unwrapping, it gives me 2 Big surprise. If you purchase more than RM150 of products on site, the box can be upgraded from the normal pink box to this Gold Digger box for free. Here is a direct link for the GoldDigger Box! This Hermosa Beauty Kit costs RM165. You can choose the shades of the Hermosa Signature Lip Creme Longwear. The box usually comes in a pink one! What you see is their limited edition #EmergencyBeautyKit that looks so so luxurious. 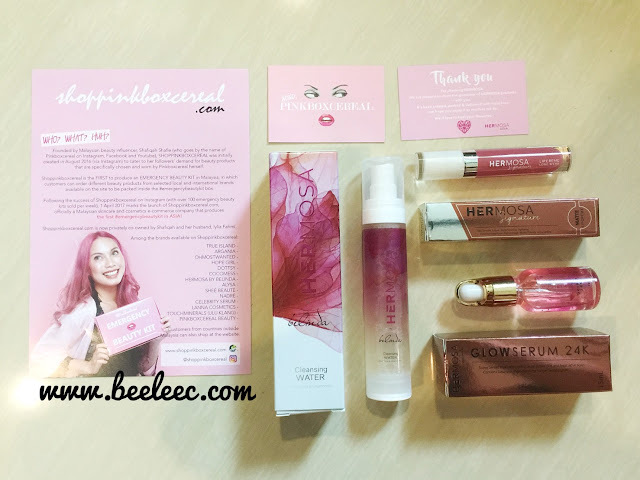 The box quality of the pink one is still way sturdier but no dents is found in this gold packaging too! 3 FUll-sized items all from Hermosa, thank you!!!! Spray a small amount of Hermosa Cleansing Water onto cotton pad & gently wipe in circular motion. Followed by preferred facial cleanser. This limited edition has added exclusive formula of pure argan oil for that extra nourishing benefits for the skin. It is suitable for all skin types. It comes in a plastic vacuum packaging which definitely helps save products till the very last drop. Its also very compact so it won't take up much weight when traveling. I am not a big fan of its very strong pomegranate-like scent though it says it contains aloe vera & chamomile. However its soothing botanical ingredients (Argan, Aloe Vera, Chamomile) helps to comfort, hydrate & add radiance to my dull skin. There is minimal formation of bubble and a creamy feel (which I do not know why as it contains NO soap and NO alcohol.) when I rub off to pre-cleanse my face. After rinsing with water and pat dry, my face feels soft and moisturized. No break out after 2 weeks of usage. Apply after toner, before moisturiser. Can be used with any other serum/essence. Can be used both day & night. Can also be used as a primer/makeup base. It comes in a glass bottle and glass dropper. It has a similar scent to the Cleansing Water but milder with a minimal perfume-y scent. There are gold flakes floating in the clear serum which makes the product looking extra luxurious! 1-2 drops is sufficient for my whole face. Face feels tight and dewy. It leaves the skin minimal tackiness after absorption. After 2 weeks of usage my face looks less dull and lesser acne formation even during days when I do not wash my face, LOL. Blackhead and whiteheads formation are lesser too. It says that it can also treat acne scars, will update again coz 2 weeks usage ain't that obvious yet. Recommended: For anyone who loves great payout and yummy scent! It is very pigmented and product spreads well as you can see in #2. I smacked my lips at #3 and almost all the lips have the product in #4. #5 shows the complete application. Lippie Removal with Hermosa Cleansing water with half a cotton at #1. #2 shows removal after 2 swipes. #3 shows clean lips after 4-5 wipes. 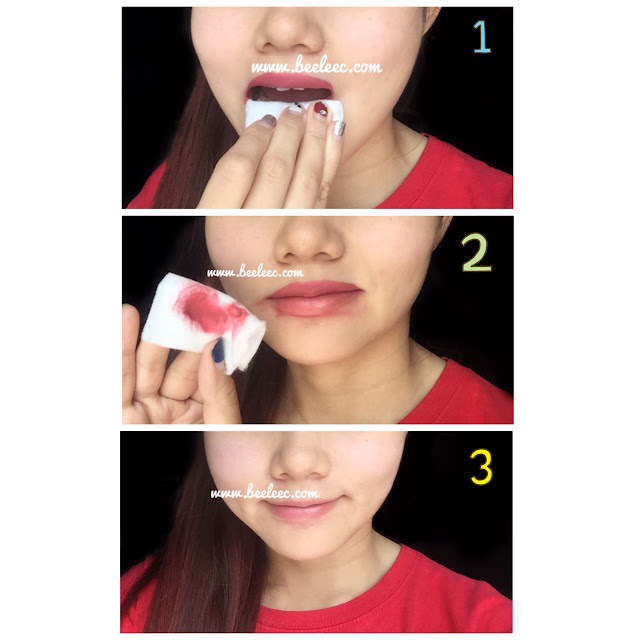 Apply a small amount on lips & blot excess creme with tissue. It comes in a clear sturdy plastic with a flat applicator. I don't know what color I got coz there is no label at the packaging. Upon opening, chocolate smell gushed out and I am honestly tempted to eat it but I cannot. Lol. It really does smell so good and NOT artificial at all! The wand makes application a breeze, even at the sides of the lips. It did mention to stay away from oily food and such but, I am eating it anyway. It definitely does not dry out my lips after some time of application but would be better if you moisturized them for longer lasting plumpness and smoothness of lips. It is super pigmented and creamy at lips, love it! Topping up color after falling off is fine too! The only downside is the color transfer is quite significant even when I am drinking a cup of hot milk tea (not like its packaging that says long lasting colors ! BUT also coz I did not blot excess creme with tissue as advised). It is not entirely smudgeproof as it dries pretty slowly to matte. Even when matte, there is still minimal color transfer (i stuck my lips to my back of hand several times and it still do transfer minimally). Color stay-wise, Orkid Cosmetic matte lippies still win. Aqua, Rhododendron Ferrugineum (Rose) Leaf Cell Extract, Camellia Sinensis (Green Tea) Leaf Extract, Phenoxyethanol, 1,2-Hexanediol, Chlorphenesin. You can spray twice daily or as often as needed. Use after your cleanser step and also after your acne toner. It comes in a clear plastic spray bottle. Spritzing was easy as it disperses quite widely. It is compact and quickly hydrates your skin whenever and wherever you need it. It has a very strong rose scent. I have been using it on-off for more than a month Now it has around 1/2 left. Recommended: For acne skin user! Shake bottle thoroughly until it becomes a milky liquid. 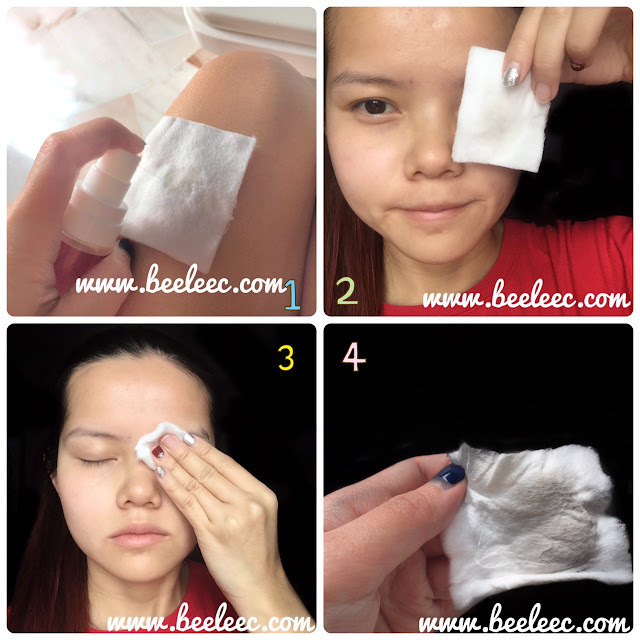 Place a few drops onto facial tissue / cotton pad and dab on areas that are oily or have acne. It can also be used to clear and soothe your pores. It comes in a clear plastic. I use it only when I have erupting acne. I would let my cotton pad of 2 drops of the solution to sit on my acne for about 5-6 second before moving onto the next one. It helps to dry out the acne as early as 3 days and recovers in about 5-7 days. I only then pat around areas with larger pores to avoid drying out of my face. 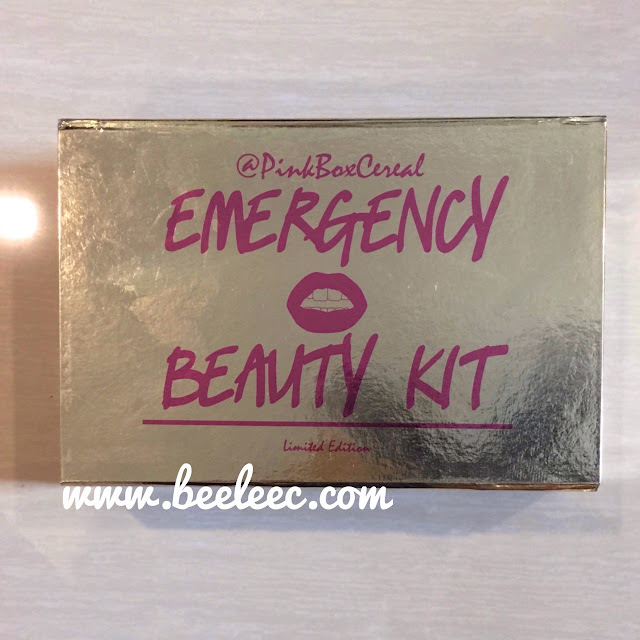 Do check out Shoppinkboxcereal for your own #EmergencyBeautyKit, here! Huh! Is ssomething new for me! Will check it out!tqs!babe! 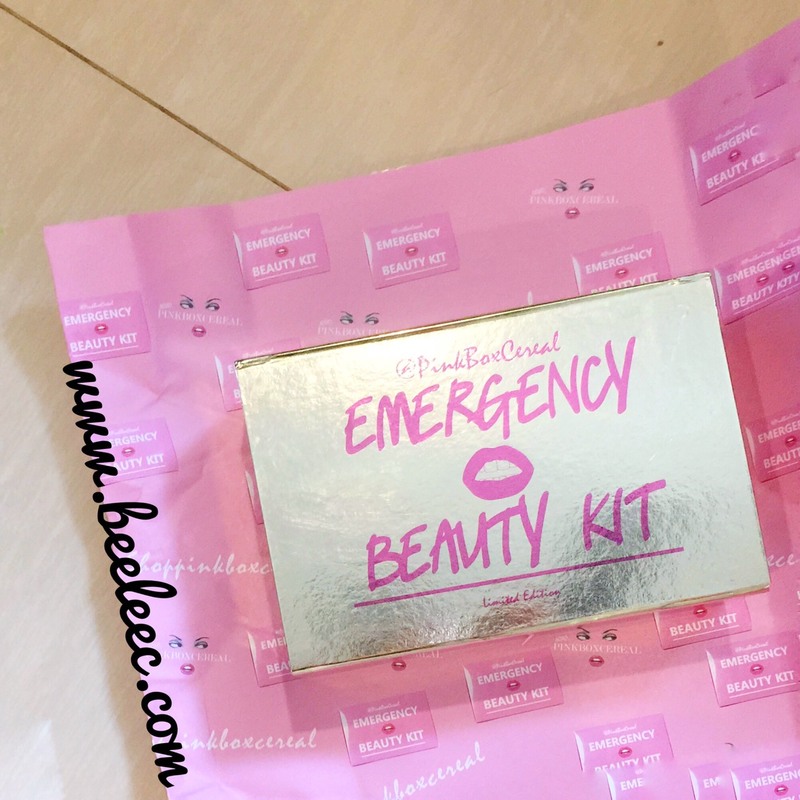 Emergency kit indeed. Love the shades! Totally love the one you have gotten. Will consider to try the cleansing water. Is it only one size? 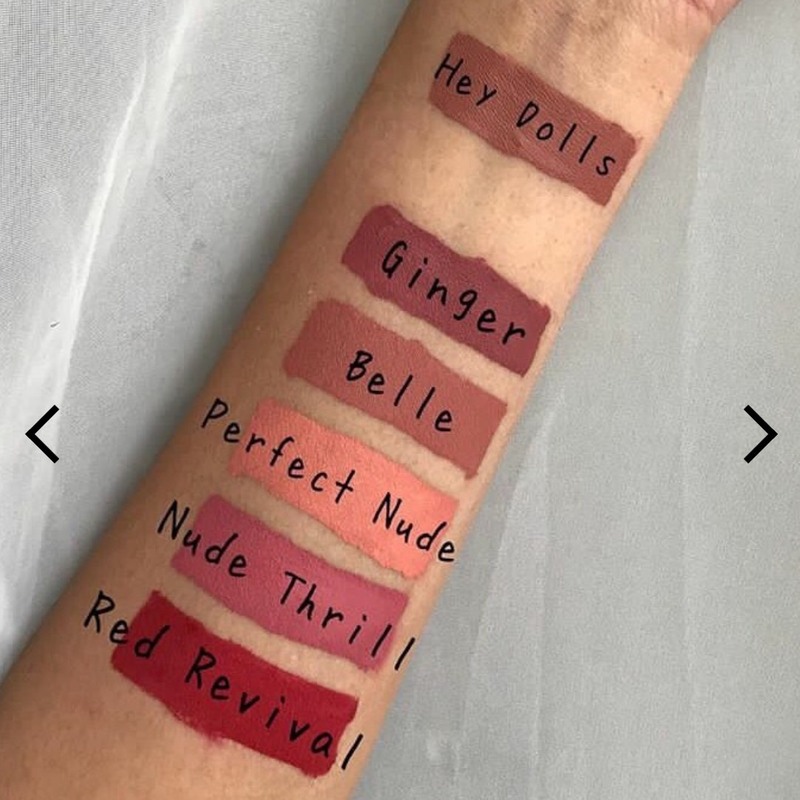 The lipstick shades look nice. I want to try too. Love the wrapper! Very creative packing too! Petite girl. Rather introverted but extremely noisy when I have warmed up to you. 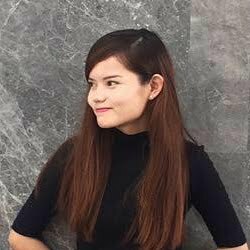 I am a Beauty & Lifestyle Blogger based in Malaysia with personal post on food, trips, services etc.